Arm® Mali™-G72 is the second generation Bifrost-based GPU for High Performance products. 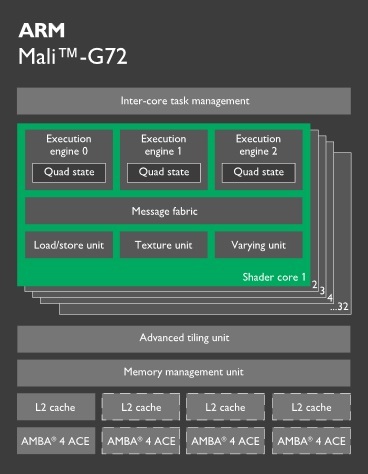 Benefitting from advanced technologies such as claused shaders and full system coherency, Mali-G72 adds increased tile buffer memory supporting up to 16 x Multi-Sample Anti-Aliasing at minimal performance cost. Arithmetic optimizations tailored to complex Machine Learning and High Fidelity Mobile Gaming use cases provide 25% higher energy efficiency, 20% better performance density and 40% greater overall performance than devices based on previous generation Bifrost GPU. Enables console quality gaming on mobile devices. Provides sustained performance for complex graphics use cases. 17% more efficient Machine Learning on device. Designed for High Fidelity Mobile Gaming & VR. Improved Machine Learning efficiency. Multiple Bifrost architectural optimizations.